Honestly, this is something that you can’t get wrong! If you are considering incorporating marble tile in your home, it’s a win-win situation. Marble is such a beautiful piece of stone having a unique color pattern in every slab. It’s imperishability will stand throughout the ages, even the four walls that it is enclosed in! Furthermore, marble is dateless and without discrimination. It will never go out of style and it complements any décor. Many people are familiar with using marble tiles as a flooring and for kitchens and bathrooms. Yet, it is important to know that decoratively speaking, marble is a versatile material. Because of it’s organic artistry and durability, it can be incorporated into many aspects of a home. Naturally, if one is going to invest in installing marble tile into a space, the kitchen and bathroom ought to be the first place where this material is placed. With the proper care, marble is essentially water-resistant. Therefore, it would be practical to have such a material in rooms that have running water and distill humidity. The next useful investment to upgrading with marble would be the floors. With marble, one doesn’t have to worry about dirty carpet that can emanate a murky ambiance and musty smells. Marble has a shiny surface that reflects light, giving a soft blush of light into the dullest space. Having marble countertops is like having a decorative cutting board on every surface in your kitchen. Imagine preparing your food without worrying about scoring or staining the countertops! Gone are the dings and dents from handling heavy pots and pans and tossing keys on them. Marble is also easy to clean. When handling raw meats, one needn’t worry about bacteria lingering if wiped up immediately. Another great attribute about marble is that with most design colors, it’s often difficult to determine whether or not the surface is indeed clean. So with marble countertops, your kitchen will at least look like it’s clean! Not everyone may agree that this is a good idea, but it can be done! Marble is a heavy material. It’s also luxurious. Using marble as a serving tray is only recommended for small and light-weighing dishes. This is ideal for appetizers like delicate meats and cheeses, and anything that won’t roll around on it’s slippery surface. Of course, doilies could prevent that! Presenting something as simple as cheese and crackers on a marble serving tray would bring the dish to another level of class. It’s like chefs say, presentation is everything! An oval-shaped piece of marble makes a lovely vanity tray to place cosmetics. It also showcases expensive perfumes, creams, and lotions. Marble would also serve well as a decorative countertop vanity that can make anyone feel like a celebrity while preparing him or herself for the day. Walls: Not Just for Floors Anymore! Designers usually choose one wall to decorate differently than the others. This is referred to as an accent wall. The accent wall serves as a focal point in a room that breaks up the monotony of having the same colored walls. It gives the room depth with a pop of color! These days, decorators are becoming more creative with accent walls by bringing back wallpaper and…marble! 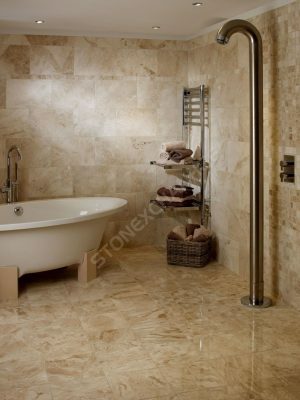 Installing marble as a wall will certainly bring another level of depth into any room! A light Arizona Ivory Travertine can attribute a tranquil note while a deep Adalia Cappuccino offers a warm and cozy feeling. The swirling patterns within marble designs also give the optical illusion that a room may appear bigger than it actually is. Keeping in line with the traditional use, incorporating columns into a home may seem like it’s a bit much, but it’s a design choice that has been used throughout history. Marble columns are perfect for foyers and wide doorways. They can also be used to fashionably separate wide spaces. This type of feature would surely refine a space presenting classic sophistication. Just because it’s marble doesn’t mean that the design must always have a classic feel. Nalboor marble comes in different color schemes. Based on the color of your furniture alone, designers have the opportunity to experiment with a variation color combinations. You also can take a risk by incorporating marble in places where it’s not typically installed. Yes, yes, marble can be incorporated in stairs. When thinking of marble, the initial conception is that it is a shiny, therefore slippery material. Yet, it still can be installed as an accent. While the actual steps can be made of typical material that will provide safety, the base of the stairs can be highlighted with a beautiful marble feature, perhaps the same color as the accent wall that could tie everything together as one cohesive design. This is simple. Whatever the color of your furniture is, choose a color that is darker or lighter. For example, if you have a white leather sofa, try incorporating Rojo Alicante as a backdrop accent wall. For darker furniture, think about a Nero Marquina Mosaic as an accent wall or maybe break up a solid wall of Vanilla Oro with the Nero Marquina Mosiac. There’s lots of fun to be had with color design choices. It’s all about how daring you want to be. So traditional uses of marble doesn’t have to be so traditional if you consider the many different ways it can be incorporated into a space. Matching marble with your home décor is simple. A great feature about marble is that, unless you are going with an engineered stone, the chances of acquiring the exact same design as anyone else is slim. Decorating your space with marble is easy. It’s all about knowing what your options are. Call Nalboor Tiles at 305-501-4548 to learn about all of the marble types and colors you can decorate your home with, or view our online catalog here.